With convention and our big national competition just over a week away it’s full steam ahead with rehearsals. April was a busy month as we had 2 weekends of coaching. The first was with vocal and performance coach, Doug Harrington. With the help of his expertise, we added the sparkle to our ballad. This included some rhythm changes and embellishments. All very exciting! We also worked on achieving a fuller sound to really ring those chords! Our second weekend took us to one of the high-rise buildings in the city, on the hottest weekend of the year so far. Even though we were indoors and the London Marathon was running (literally!) close to our building, we brought the sunshine inside with the energy from coach Rob Mance. Rob Mance’s specialty is posture and during the weekend we each took on the daunting task of singing solo in front of the rest of the group, while he corrected our alignment. We discovered that the “Official London City Singers stance” is leaning too far back with the head too far forward. Those with this posture (all but two people) were corrected to lean forward, with our heads back and chin down. And also to not move our jaw too much! Throughout the weekend we only worked on posture, positioning on the risers, and singing concepts. So when it came to singing through our contest set at the end of the Sunday rehearsal we were astounded by the changes in our sound. Who knew that having more chins and less jaw movement could make such a difference without even working on the songs. It’s safe to say that we have had a busy week! On Saturday we had our CD recording in a beautiful church in North London. After a thorough warm-up, we got straight into it. We recorded each of our songs a couple of times (ok, some of them may have needed a few more takes) and then suddenly – way too fast – it was all over. The whole process was nerve-wracking and exciting, and definitely an experience we’re all going to remember for a long time. We marked the occasion with a Facebook Live stream of one of our favourites. Check it out here. With our Kickstarter campaign coming to a close this week, it’s full steam ahead with the mixing and mastering of the CD for the pre-release in February 2018 (General release: March 2018). We cannot wait to hear the results of our hard work and we are excited to share it with you all. Then the fun didn’t stop there! On Tuesday instead of our normal rehearsal we hosted a Scratch Quartet evening along with Meantime Chorus. Members from both choruses joined together to form mixed quartets and performed to a rapturous crowd of chorus members. There were laughs, interesting costumes, a quartet made of Simon Arnotts (see photo) and plenty of awards. Check out our Facebook page for more photos. Join our 10th birthday celebrations! Support our debut collection of classic barbershop harmonies and cool new arrangements. As the only women’s barbershop chorus in the City of London, we want to share our great four-part a cappella harmonies with our debut music album. We’re putting together a great mix of music, including folk, classical, pop and West End/Broadway numbers. Five of the ten tracks have been arranged especially for us by our Musical Director, Simon Arnott. We’re all set to record in November with a pre-release by February 2018 and the entire album ready in March 2018. To make this a reality, we need your help. The money we raise through Kickstarter will fund the basic album production. Anything we raise beyond our target will pay for licensing, album cover design, CD replication and distribution. With your generous support, we can make this happen together! We’re growing – many new members! London City Singers is growing. We’ve had so many new ladies join recently that we regrettably can’t let anyone else join for now unless they can sing the low notes of the Basses – to keep the balance of voice parts. Hi everyone, my name’s Jo and although originally from Sussex I have lived in London for the past 8 years. When I’m not singing with the lovely LCS I like to go exploring – whether it’s finding a new country to visit, a new person to meet or a new wine to drink! I wanted to get back into singing after a couple of years without a choir and found LCS through a trusty google search. I was looking for a friendly yet professional choir, and have to say I’ve really struck gold with LCS! Such a tricky question… but I think I’ll go with ‘Songbird’ (the Ella Fitzgerald version). I walked down the aisle to that song, so it has lovely memories. I am someone who loves singing and music and I was in a close harmony/barbershop group while studying at St Andrews University. I am in a band right now and I also love to perform in flashmobs (was part of ‘One Day One Choir’ and ‘I Can’t Keep Quiet’ recently). I currently work at the BBC as a Project Manager. I joined LCS as I’d been looking for a new choir of a high standard in central London. I also really enjoyed being part of a barbershop group at Uni. I Iove too many songs and genres to pick a favourite! A business psychologist by day, musicals and theatre geek by night, mother twenty-four hours! I found LCS when I was seeking a non-classical choir. I was a member for 4 years until 2014 when I stopped due to other commitments. I have rejoined because singing with other people makes me happy, and I was missing the creative outlet of being in a chorus. This is the first time ever that I’m singing barbershop! I’m both excited and nervous. I’ve been in choirs before, but nothing quite like this. By day I am in the corporate world, night time I am jogging or dancing (salsa/ ballet). The skill that will probably serve me well in the chorus would be my breathing technique from yoga! I was at the voice festival about 5 years ago and that was the first time I ever saw barbershop singing and I thought – what have I been missing in life?! It took me a few years to get round to this. Growing up in an all-girls school means that a female chorus is perfect for me! I’m currently discovering the delights of sleep deprivation being a new mum, although we also have a favourite baby class ‘sing and sign’ which means I get to sing much more in my new job than my last! Previously I was a project manager and may go back to that next year. I discovered LCS many years ago just by chance and fell in love with barbershop, after 6 years I left to have my daughter. How could I not come back once I had the chance! 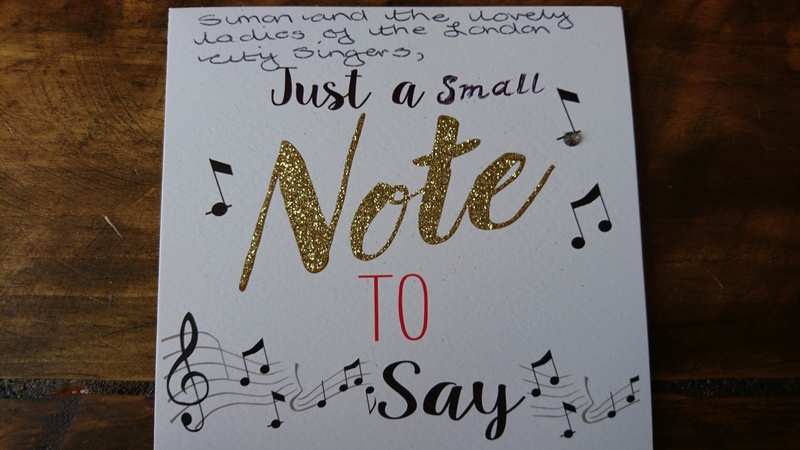 At our summer concert, we were asked to sing a special happy birthday to Sheila who had been brought along as a surprise treat for her 85th birthday. 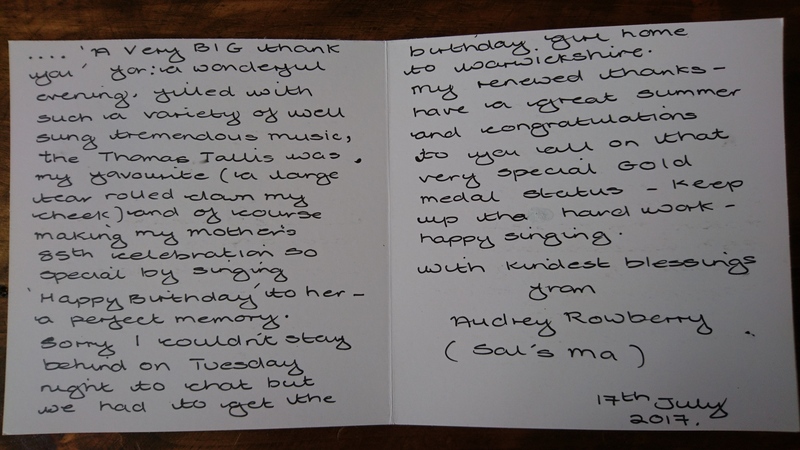 Sheila’s granddaughter Sal is one of our chorus members in the lead section and Sal’s mum sent us this lovely card afterwards, (excerpt transcribed below). In this month’s meet a member it’s our resident social media whizz, Adel who’s celebrating her first anniversary with the chorus. Well hello! Firstly I love singing, obviously! My life pretty much revolves around music. I set up events for a ticketing company for work and I spend a lot of my time at gigs, or just being a geek listening to a cappella groups on YouTube. I’m a big fan of the show people love to hate: The X Factor. I also enjoy movies and dance fitness classes (good to get ideas for choreo!). How did you find out about LCS? I’m a bit of an old timer when it comes to Barbershop and I was a member of 2 other Sweet Adelines choruses, so I’d heard of LCS through that. After a bit of a break I was missing some 4-part harmony singing in my life and when I realised the rehearsal hall was so close to my work I thought I would pop along. I loved it and the rest, as they say, is history! What was your first experience of a cappella or Barbershop and who did you see? My first experience of Barbershop was when my mum handed me a leaflet for a free singing course local to my house. I dragged a friend along and quickly realised that they were actually forming a chorus which would later be known as Cheshire A Cappella. I quickly fell in love with this hobby and soon became a member. But what really gave me an insight into Barbershop was an education evening with the male group, Westminster Chorus from the US. I was blown away by their talents and later on, I ended up singing tags in the bar with some of the members. It was a fun, but surreal evening. Tell us one thing that people would be surprised to know about you? I taught myself to do a weird tongue curl when I was a kid. Clearly, I had too much time on my hands. Probably a song by Steps as that would make me forever happy! This month we welcome a new member to the baritone section: Harriet (AKA Bariet, pictured in the middle with the grey top). With a sister already in the chorus and being part of the team supporting us at the convention in Spain, it’s like she was a member already. I am super psyched to be joining the chorus! I love singing with other people and I think what London City Singers are doing is pretty darn cool. I also like playing games, spending time with animals, especially chickens, and working with children. Also tea! Through my sister Leila who was already in the chorus. She’s older, in case you’re wondering. I tagged along to the SABS 2017 convention for a holiday. It was ridiculously fun and I wasn’t even singing! I’d been in choirs before but never an all female or barbershop chorus, so I was keen to give it a go. The Kings Singers! They were guests at a concert I saw when I was about 15 and I was hooked. I can make a noise like a woodblock. London City Singers’ CCC (Chorus Coordination Committee) gets a refresh every May. Each post on the CCC is filled on a two-year basis, with roles staggered to ensure a level of consistency from one year to the next. There are a few roles that need to be in place for each chorus; a team leader, finance lead and membership/secretary, and it’s required to have at least six in total to form the group. We’ve spent time working the most useful mix of roles to form our committee, and below explains each role, a little bit about what they do and who we have in place going forward. Simon Arnott (Music Director), Daisy Blench (Events Co-ordinator) and Lan O’Connor (Marketing Co-ordinator) remain in post, as well as Aurélie Gandour (Finance Co-ordinator) who took over from Sarah Palframan when she went on maternity leave late last year. A big thank you to those who’ve supported the chorus over the past year working in the CCC, and special thanks to Aurélie for sourcing these lovely presents for those leaving their roles (click to see the pics on our Instagram page). A birthday, quartet night and awards on one night! Last Tuesday, 15 Nov, was a very exciting night at London City Singers for three big reasons — it was our annual quartet night, the chorus awards results were announced and it’s our 9th birthday! The awards/snacks table was set out and we were ready for a night of great entertainment from our talented members. Eight quartets stepped up to perform. Some had epic ballads, some had sweet melodies, and some were just damn right wacky and hilarious. Highlights were Hail Mary and their side-splitting rendition of Big Hair, complete with metallic ponchos and a balloon at the back of Katherine’s head (don’t ask!). Pindrop had the moves, and Relativity began their set by candlelight singing Pitch Perfect’s Cups song. While our judges for the night (Sophie Hasson, Luke Stevenson and Ali Hay-Plumb) were making their tough deliberations, the winners of the LCS Awards 2016 were revealed. We had awards for Joker of the Pack (Ruth & Sal), You Got the Moves (Adeline), Little Miss Sunshine (Emma), Can’t Get Rid of Her (Hazel) and even a Red Knicker Recipient (Mariane). Our musical director, Simon, won the You Go, You award, and the ultimate recognition, the chosen Sweet Adeline of the Year was Katherine. After the whole chorus sang Happy Birthday and blew out the candles for our 9th anniversary, the time had come for the quartet results. Pizzazz snagged third place, Hail Mary came second, and Relativity received the coveted first place for their awesome performance. All in all, it was a fantastic night of laughs, singing, and a few too many sausage rolls. Now we have a whole year to wait until we can do it all again!